Odenza Marketing Group is proud to announce the launch of their U-Pick a Vacation travel incentive to clients across the United States and Canada. 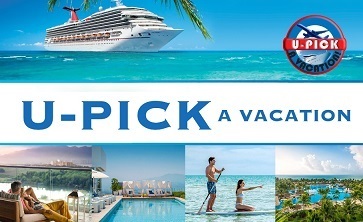 The U-Pick a Vacation travel incentive product allows recipients to choose between two key vacation experiences: a 5-Star Luxury Resort Getaway or a 5-Day Carnival Cruise. Odenza offers a collection of lavish resorts located at Mexico’s most beautiful destinations. These are top rated properties, one with a Cirque Du Soleil venue on site, and another property was featured on ABC’s TV Series “Bachelor in Paradise.” Along with being able to opt for a 7-night resort stay or 5-day cruise, recipients can also choose from a range of different resorts or cruise experiences that best suit their preferences. “We’re incredibly excited to re-launch the U-Pick a Vacation package. We had introduced this U-Pick product 12 years ago for the Automotive Retail market and it was a hit for a couple of years. We decided to introduce it again as we had noticed a number of our existing clients campaigning ‘You Pick a Vacation’ on their Facebook pages, company websites, and radio ads. The ‘U-Pick a Vacation’ tagline has a really nice ring to it, and giving customers the freedom to select their ideal getaway is a great way to incentivize customers and provide businesses with some extra pulling power,” says Pav Sangha, Vice President of Marketing with Odenza Marketing Group. Odenza is confident that the U-Pick a Vacation travel incentive will enhance companies’ advertising so they can close more sales and capture more customers. Travel is the most widely appealing incentive – everybody wants a vacation, and a complimentary vacation is that much better. Sales people will close more sales, customers will enjoy an exciting vacation experience, and businesses will grow. Businesses can give away these trips very easily and gain a competitive advantage over their competition! Whether they decide to use them as closing tools or give them away as contest prizes, the promotional ideas around these trips are endless. Odenza provides marketing materials to help with promotional efforts. When the customer makes a purchase, businesses simply hand them the U-Pick travel certificate. After that, Odenza’s travel department takes care of everything else beyond that point. Odenza’s in-house travel agency is staffed by certified and experienced travel agents who work directly with clients’ customers to book their vacations. Odenza provides quality incentive marketing solutions that give our select clients a competitive edge in their market. Odenza has been providing incentive travel certificates to companies for their promotions since 1998. Our marketing and advertising support team provides you with everything you need to make your promotion a success. Odenza is also a three-time recipient of Carnival Cruise Lines’ “Pinnacle Club” award for demonstrating exceptional creativity in sales and marketing techniques. We are members of the New Car Dealers Association, the American Resort Development Association and the International Promotional Products Association. Our in-house travel agency is staffed by certified and experienced travel agents who work directly with your customers to book their vacations. We have direct partnerships with major airlines, cruise lines, hotels and resorts worldwide. Odenza has delivered 3420 promotions in the last 3 years with 1140 clients in 43 industries throughout North America. Odenza is a three-time recipient of Carnival Cruise Lines' "Pinnacle Club" award for sales excellence and a member of Funjet Vacations "500 Club" of travel agencies. Odenza was recognized for providing superior customer service, demonstrating expertise in Funjet vacation destinations and ensuring that customers receive the best vacation value available.